I am a member of the Ennis Chapter of TOPS (Take Off Pounds Sensibly). Those initials also might stand for “Take Off Pounds Socially.” As a social being who finds it difficult to remain motivated in isolation, I tried unsuccessfully to take off weight by myself. Seeing the weight creep up over the years so that my size 8 body needed a size 14 to cover it, I had a wake-up call when the 14s were too tight and I realized I might need a 16 if I did any shopping. Hey, I am only 5’1″ and this body was never intended to be more than an 8. Age is not an excuse! Lots of pictures were taken at our 50th wedding anniversary party. When I saw those, I realized pictures don’t lie. I was FAT! I didn’t like the looks of myself. I needed to stop procrastinating and making excuses, stop looking at my obese aunts and rotund paternal grandmother, and telling myself, “You can’t help it. It’s in your genes.” WRONG! My mother avoided excessive weight gain. My father did not become round like his father and mother had. I needed a support group who could help me become accountable – and a program that would teach me to make wiser food choices. A friend here in Ennis, Montana who is about my height and used to weigh about what I did, encouraged me to join her in the newly formed TOPS group. My friend had lost a pound a week over about 25 weeks. She looked terrific. If she could do it, I decided, I could, too. I joined. That was about a year and a half ago. Today I have reached my 30 pound weight-loss goal and have graduated to KOPS status. I have given away all the size 12s and 14s – and I am determined to live up to the KOPS label: Keep Off Pounds Sensibly. I presented my weight steps “secrets” in a program for my support group today. I titled it “Hope for the Marigolds” and gave a marigold plant to each of the others (5 of them) who also has reached her goal weight. ** Some of inspirational guidelines that TOPS members are familiar with are the pledge we recite at the beginning of each meeting and the poem we recite at the close of each gathering. They are below. And we’ll start out today. To guide us along our way. For the road to goal is a rocky path. We need someone to care. So, reach out, my friend, and take my hand. Unlike some other weigh-loss organizations, TOPS does not end when you have reached your goal. It only costs $5. a month to join the local organization – and an annual dues of $29. for the national membership. It is not only affordable to remain in the group, but it is wise, encouraging, and altruistic. By continuing to belong, members encourage one another, remain accountable to the group, recognize the importance as serving as a role model for others, and keep from slipping back into old habits. TOPS and KOPS are not a diet program. They represent a way of life. Once you have learned a healthier way to live, you won’t want to slip back into those bigger sizes ever again – and you will want to be there to support your new friends, just as they supported you when you were on the path to a better body. 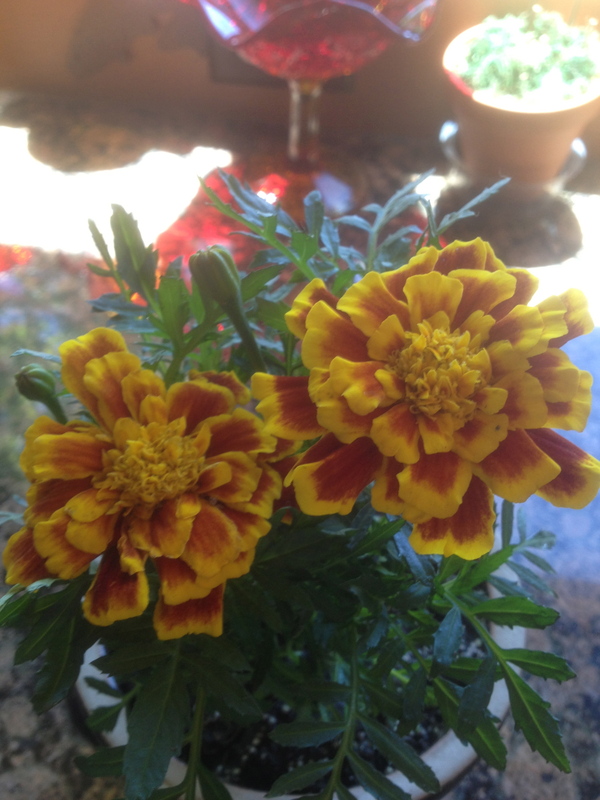 I gave a marigold plant to each of the ladies who had met her goal. I encouraged the others to follow the seven steps being “Merry” and reaching their “Gold” also. I have a marigold for you. Come join us!